Mark your calendar as starting today, through the 29th, there's no better way to spend an afternoon than at Starbucks drinking a Half-Price Refreshers. 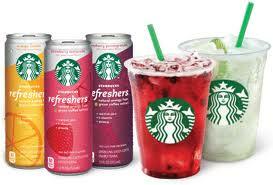 Learn how you too can grab a FREE Starbucks Refresher Drink. With as HOT as its been this looks like a cool treat! I am super excited about all the awesome promotions that Starbucks has been running. Again this deal is valid from June 27th-29th from 3-5pm at participating Starbucks.